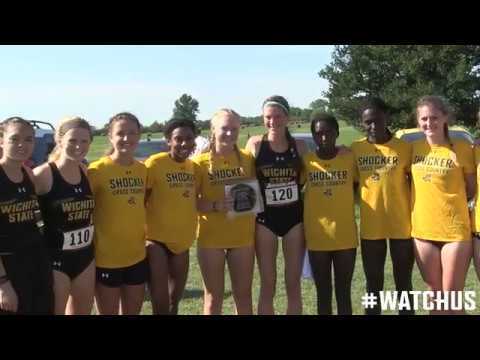 An early look at the Lady Shocks XC prospects for this year. The super young Shocker XC team of last season finished 6th in the AAC Championships as they tied ECU and won the tiebreaker. With Jr. Rebekah Topham back after reshirting last year the Shocks, with So. Winny Koskei improving throughout the year and gaining a lot of confidence with her 5K and 10K wins at the AAC Outdoor Championships and with Jr. Winnie Kibet joining her fellow Kenyan Koskei after transferring from Colby CC the Shocks look to be significatnly stronger this year. Add So. Yazmine Wright and So. Gabriela Reyna to the mix and the Shocks potentially have a pretty strong top 5. I don't think the Shocker ladies quite have the quality depth that the Shocker men have but Sr. Tangy Wiseman, So. Rita Schnacker, and Sr. Diedra Walker and perhaps Fr. Destini Eskridge out of Maize South may be able to help push the top group and be reasonable backups in case of injury to or a bad race for one of the top 5. The only senior of note who the Shocks lost from last year's team was Jordan Maestas. Hopefully, all of the returning runners will be stronger, faster and smarter with an additional year under their belts. The Shocks should move up to no worse than 5th and perhaps as high as 3rd. However, UConn and SMU will be very tough to dislodge at the top of the heap. According to twitter last week, Coach Hunter has added Hope Saunders to the squad. She's from Ireland and went to Florida as a freshman and appears to have some very solid marks. Should probably be a top-5 runner if she gets back to her previous form from her freshman year at Florida. Coach Rainbolt officially announces his 2018-19 list of newcomers which inlcudes 16 men and 11 women. So are any of these ladies ready to step in and contribute AAC championship points this year. As I stated in a previous post when Amiya Anoma's committment was announced her best 400m hurdle time would have been 6th best in the AAC last year and her triple jump of 40-9.5 would have been 7th best in the AAC last year. Maya is 6-2 and 150 lbs. Those long legs no doubt help a lot in the hurdles and the triple jump. Not sure Rainbolt has had many that fit that mold and it will be interesting to see what Coach Rainbolt's plans are for Amiya. Halie Brown out of Ark City has a 146-0 high school PR in the javelin which is pretty solid. That distance would have been a top 10 mark in the AAC last year. However, I don't know if their is any difference in the javelins used at the high school level and those used at the collegiate level. I do know that Shocker Sr. Carlea Miles, who had the 3rd best throw in the AAC last yeat at 163-3 had a high school PR of 144-4. Tiana Holmes out of Moore, OK has a high school PR of 54.94 in the 400 meters and that would have been a top 10 mark in the AAC last year. Aleenah Marcucci will be a sophomore multi event athlete after transferring from Iowa State. She has had some injury problems but looks like she is right there with Shocker sophomore Kendra Henry in the pentathlon. Alleenah's PR's in the indoor 60 hurdles and the long jumps would have both been top 10 marks in the AAC. Her outdoor 100 hurdles would have been top 15. If she can stay healthy she and Kendra should push each other to improve and score some points for the Shocks. Sidney Sapp out of OKC has a high jump PR of 5-8.75 which would have been 5th best in the AAC last year. Good get espeically since the Shockers top jumper from last year, Jr. Kaite Murray who had a PR of 5-8, is not listed on this year's roster. With all the ladies coming off of redshirt years last year I would expect that some of these ladies will be redshirting this coming season as well. It will be interesting to see how this past year's big redshirt strategy works out. Welcome to Shocker Nation Ladies! Last edited by 1972Shocker; August 5th, 2018, 10:34 AM. Rebekah Topham returns and Wichita State's women's cross country enters the season with high expectations. Topham redshirted last season after winning the 2016 Missouri Valley Conference cross country meet. She wanted take a full year off from competition to train with the expectations of running in NCAA meets in her final two seasons at Wichita State. She should team with sophomore Winny Koskei to give the Shockers at least two runners capable of finishing near the top of most fields. Coach Kirk Hunter expects both to challenge for spots in the NCAA Championships. And there may be more Shockers running at the front of the pack. "Rebekah looks very strong and Koskie looks really strong," Hunter said. "They came back prepared from the summer." Koskei finished 18thin the American cross country meet last fall and improved throughout the school year, leading to championships in the American outdoor track and field meet in the 5,000 (16 minutes, 49.01 seconds) and 10,000 (35.21.14). In addition to Koskei, several sophomores will play important roles this fall. Rita Schnacker pushed Topham and Koskei in a recent run. "That, to me, was amazing," Hunter said. "(Schnacker) had an amazing summer training." Junior Winnie Kibet, a transfer from Colby Community College who redshirted last spring, placed third in the 2017 NJCAA 5-kilometer cross country meet with a time of 17:54.8. "She is a very competitive young lady," Hunter said. You know you have a special athlete on your hands when a women's XC runner gets a featured article in the Eagle. While Taylor Eldrdige chose to focus his report on Rebekah Topham, Paul Suellentrop sitll had more than enough interesting stuff on Winny Koskie, the defending AAC outdoor 5k and 10k champion, to fill up another very good article. Winny went from the the 8th or 9th best runner in her redshirt year two years ago to a double AAC champion at the end of last year. Another positive for this group of Lady Shocker distance runners is that there are no seniors among the top 3 runners, Rebekah (a Junior), Winny (a Sophomore), Winnie Kibet (a Junior) and there are several other sophomores with the potential to be very effective including Rita Schnacker and Gabriela Reyna and perhaps Hope Saunders, a transfer from Florida who hails from Dublin, Ireland. Good stuff from both Taylor and Paul on these ladies! Saturday's race is only a 4k so don't read too much into the final results. It's basically a hard workout for these girls. Sophomore Yazmine Wright is another one to be in the mix of the top-5 Shockers. She's more of an 800 runner in track but she improved nicely last year. Rebekah and Winny live up to their pre-race hype as the pulled away from the field to finish 1-2 in the opening XC meet, the JK Gold Classic at the Four Mile Creek Resort in Augusta this morning. Rebekan crossed the finish line in the 4k race in 13:48.3 with Winny right behind her at 13:49.9. Wiinny Koskei's fellow Kenyan, Winny Kibet, a juco tansfer from Colby was 3rd in 14:32.7, sophomore Rita Schnacker was 7th in 14:40 and sophomore Yazmine Wright was 9th at 14:49.6 to account for the Shockers 22 points (1+2+3+7+9) outdistancing K-State (54 points) and Missouri State (61 points) as well as Newman, Friends and Emporia State. The Shockers had 6 other runners in the Top 21 including 4 who ran unattached which indicates they may be redshirting. Last edited by 1972Shocker; September 1st, 2018, 04:27 PM. With the Shocks preparing to host the AAC Outdoor Track and Field Championships in the spring the Cessna Stardium track has been resurfaced. Looks great! Sure wish we could put some lipstick on the pig (Cessna Stadium). The Shocker XC teams head to Fayetteville, Arkansas for the 30th Annual Chile Pepper Festival which will feature approximately 6,500 athletes from nearly 120 high schools and 80 colleges. Who says cross country can't provide an economic boost. The Shockers return to Fayetteville after not competing at the Chile Pepper Invitational last season. In 2016, Rebekah Topham, as a sophomore, finished 10th overall leading the women to a fourth place team finish. Top-ranked Arkansas enters the competition as the team to beat. The Razorback men and women rank No. 1 in the south central region, as well as top-15 national rankings. Should be a good challenge and a good measuring stick for the Shocks. The Shocker women's team finished second Saturday morning at the 30th Annual Chile Pepper Festival. Yazmine Wright ran a personal best time of 18:03.5 to place 24th, followed by Winnie Kibet in 41st (18:18.7) and true freshman Halle Johnson in 56th with a personal best time of 18:32.8. "Winny Koskei ran really well, she had an amazing race," said head cross country coach Kirk Hunter. "The course was soft and slow, the team adjusted to the rough conditions very well. Yazmine ran a really good race, a 24th place finish is a strong showing against this field and top-ranked Arkansas team." No. 9 Arkansas women won the team title with 26 points, including finishing three Razorbacks in the top-5. Freshman Katrina Robinson of Arkansas won the individual title with a time of 16:15.3. 423 athletes and 51 teams competed in the women's 5K. On the strength of Winny Koskei's storng race at the Chile Pepper Festival Winny has earned AAC Female XC Athlete of the Week honors (a Shocker 1st in XC). Winny's progress in just over a year at Wichita State has been very impressive. It will be interesting to see how far she and Rebekah Topham can push each other. Wichita State cross country gets its first big road testof the season when it competes in Pre-National Invitational in Madison, Wis., on Saturday. The Shocker women face 10 ranked teams, including No. 1 Colorado and No. 4 Oregon. "This meet is always a meet that gives us a very true indication of who we really are," coach Kirk Hunter said. "You can feel good about your season because of the way you, maybe, performed in some smaller meets. Until you really line up against the best, you don't know. This is our first opportunity to show if we really are as a good as we think we are." Winny Koskei and Rebekah Topham are runners with the potential to compete at the top of the American championship meet and advance out of the NCAA regional meet. Hunter sees them with a chance to finish in the top 20 on Saturday to take a step toward establishing those credentials. "Winny is looking absolutely fabulous," Hunter said. "The thing about Rebekah is that I believe adrenalin fuels her. Whether there is an issue or not, she is an extremely strong competitor when it comes to crunch time." Not sure what to read into Coach Hunter's comment on Rebekah. Sounds like she may not be at 100% physically. The AAC Championships follow 12 days after this meet on October 25th. Winny Koskei continues to develop rapidly into a top-shelf collegiate runner as she finished 11th in the Pre-National Invitational race with a new PR of 20.28.9 which was about 25 seconds behind the winner powerhouse Arkansas in the 6K women's race. Rebekah Topham also had a strong race finishing 38th in 21:00.2. This was 23 seconds off of Rebekah's PR and while XC times are difficult to compare from course-to-course and with varying weather conditions I continue to wonder if she is 100% physically. In any case a good showing from Winny and Rebekah as the Shocks will now focus on fine tuning and getting healthy for the AAC Championships on Thursday, October 25th in New Orleans.